Elon Musk really wants to get to the Moon – and “as fast as possible,” he wrote in a tweet last night. The Twitter thread also included new details about SpaceX’s Raptor engine, which could boost the spacetech company’s enormous stainless steel Starship into space. Conventionally, rockets have used multiple stages, each specialized for flight through Earth’s atmosphere or the vacuum of space respectively. SpaceX appears to be streamlining the process with one engine design, according to Ars Technica’s analysis of Musk’s tweet. The approach will have some key advantages, according to Ars: it could take significantly less time and money to develop and test the rockets. So what about Mars? 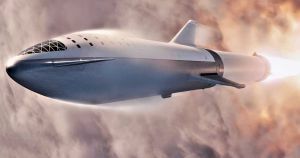 SpaceX touted Starship as the ultimate passenger vehicle that could ferry people all the way to the Red Planet. So why all the talk about going to the Moon? There’s a good chance it has to do with limited budgets. Earlier this year, SpaceX laid off 10 percent of its staff as part of a “strategic realignment.” After all, launching thousands of satellites and developing giant spaceships is expensive. Besides, SpaceX already promised a Japanese billionaire a trip around the Moon on board the Starship. But Mars isn’t out of the question yet. Given enough time and money — and eventually completed trips to the Moon — SpaceX could still make it to Mars.